A wine glass that won’t tip over even when you push it, tap it, or knock it? Yep, that’s what we’ve got on our hands… and what you’re about to have in your hands! We’re not sure how Mighty Mug did it. They say they use Smartgrip technology (though we think they spliced and used the genes of those people that stand in the middle of a supermarket aisle and just won’t move for you and your fully-laden trolley). 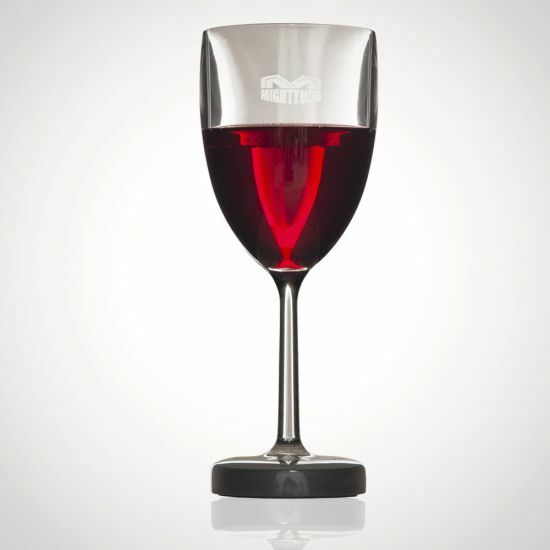 Point is, this wine glass grips to any flat surface and simply won’t move, no matter how much you push it. But, when you want a sip, it lifts straight up without a worry. Oh, and in case you do accomplish the feat of knocking it over, it comes with a sippy lid for extra protection! This glass isn’t actually glass. Instead, it’s made of Tritan – a plastic that’s tougher than, well, a wine stain and yet as clear as your list of worries when you have a glass of wine in hand! This plastic is 100% BPA-free and top-rack dishwasher safe. So, if you want a wine glass that’ll stay standing long after you’ve gone wobbly (oh wine, you wonderful nectar), then you need this Wine Glass That Won’t Fall Over from Mighty Mug!